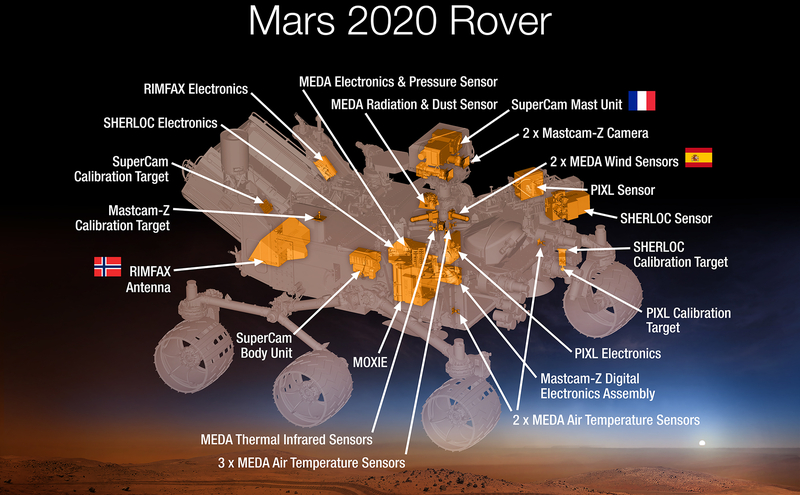 This 2015 diagram shows components of the investigations payload for NASA's Mars 2020 rover mission. Science instruments are state-of-the-art tools for acquiring information about Martian geology, atmosphere, environmental conditions, and potential biosignatures. An advanced camera system with panoramic and stereoscopic imaging capability with the ability to zoom. The instrument also will determine mineralogy of the Martian surface and assist with rover operations. A set of sensors that will provide measurements of temperature, wind speed and direction, pressure, relative humidity and dust size and shape. An exploration technology investigation that will produce oxygen from Martian atmospheric carbon dioxide. An X-ray fluorescence spectrometer that will also contain an imager with high resolution to determine the fine scale elemental composition of Martian surface materials. PIXL will provide capabilities that permit more detailed detection and analysis of chemical elements than ever before. A ground-penetrating radar that will provide centimeter-scale resolution of the geologic structure of the subsurface. A spectrometer that will provide fine-scale imaging and uses an ultraviolet (UV) laser to determine fine-scale mineralogy and detect organic compounds. SHERLOC will be the first UV Raman spectrometer to fly to the surface of Mars and will provide complementary measurements with other instruments in the payload. An instrument that can provide imaging, chemical composition analysis, and mineralogy. The instrument will also be able to detect the presence of organic compounds in rocks and regolith from a distance. This instrument also has a significant contribution from the Centre National d'Etudes Spatiales,Institut de Recherche en Astrophysique et Planétologie (CNES/IRAP) France.